Hearts Free Download from Store Now! 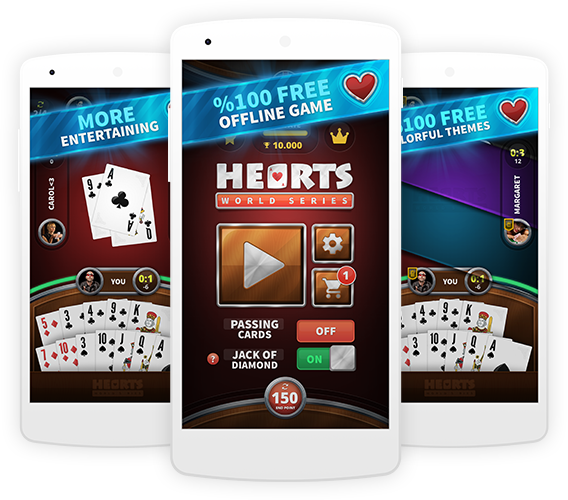 Hearts is a quick and enjoyable card game based on counting cards and luck. Users can enjoy with different game modes through highly unique AI. Users can reach new ranks, achievements while they are unlocking colorful backgrounds with entertaining game experience. The game graphics have been designed realistic for motivating users to play more realistic game. We would be glad to see you as a part of this experience! Spades Free Plus, Spades Free, Pisti under the name of Gamehook Studios.